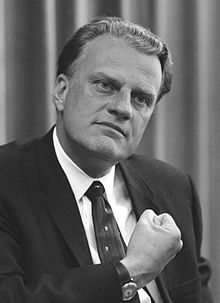 The Billy Graham Evangelistic Association takes the message of God's love to the world through crusades, conferences, television, radio, film, publishing, the Internet, and other international ministries. For more information write: Billy Graham Evangelistic Association, 1 Billy Graham Parkway, Charlotte, North Carolina 28201. The following is a personality profile of Billy Graham based on his work. Billy Graham is social, unpretentious and can be perceived as compulsive. He is empathetic, he feels what others feel and is compassionate towards them. He is confident as well: he is hard to embarrass and is self-confident most of the time. But, Billy Graham is also content: he is content with his level of accomplishment and does not feel the need to set ambitious goals.